I saw everywhere Deputy CIO (Deputy Chief Information Officer), but how do I prove it? Could you advise me the source (with IT positions) I may use as a reference? HR department uses CIO Deputy, but I suggest it is wrong. 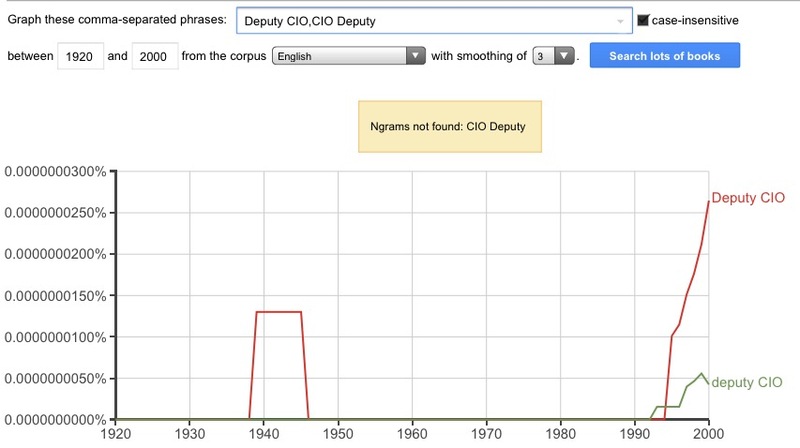 This doesn’t mean that CIO deputy has never appeared in printed sources, but that a query could not find at least 40 hits. To narrow down the results, you might try an Elephind search, which queries a number of collections of scanned newspapers. A query for CIO Deputy yields 11 hits, all of which are OCR errors for "ex-officio deputy" because the software couldn't handle the ffi ligature. These results should convince your HR department. When it comes to language usage, an argument from silence should always win. Not the answer you're looking for? Browse other questions tagged terminology it or ask your own question. What are exchanges like “How are you,” “I'm fine,” and “See you later” called? What would you call in English a forbidden or restricted language?